Working with the Montreat Conference Center, the Presbyterian Heritage Center (PHC) at Montreat opened its basic reference library and multiple temporary, interactive exhibits (from existing and borrowed archival materials) at Spence Hall, at the intersection of Assembly Drive and Georgia Terrace. For more information go the PHC Library page. 1765 Kemback Church of Scotland, in Fifeshire, Scotland. Minister: Alexander Walker (years of service: March 1736 - 1780). Source: Burzinski 3954, Cresswell 3494. 1802 Associate Congregation Church, Glasgow, Scotland. Minister: Rev. Dr. Robert Muter (years of service: 1800 - 1842). Source: Burzinski 2846, Cresswell 2528. Lester Burzinski. Communion Tokens of the World. 1999. O. D. Cresswell. 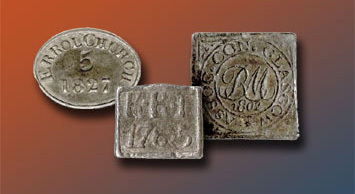 Comprehensive Directory of World Communion Tokens. 1985. Manuscripts, letters, documents not required to be deposited with the Presbyterian Historical Society in Philadelphia or at a Presbyterian Seminary, such as Columbia Theological Seminary in Decatur, GA.
Montreat brochures and other paper ephemera. We are specializing in the history of Montreat and Presbyterianism both in the U.S. and around the globe. A more detailed Collection Guideline has been released. If you have a question or have something you wish to consider donating or lending to the Presbyterian heritage Center at Montreat, please contact us (click to email) before sending anything. Thank you. © 2013. Presbyterian Heritage Center at Montreat.